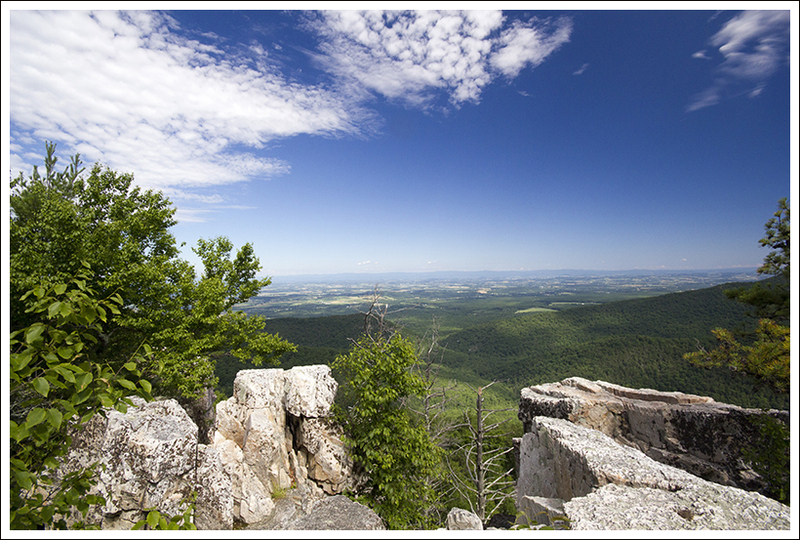 If you’re looking for a short, easy hike in the vicinity of the Riprap trail (southern district – Shenandoah National Park), the 3 mile walk to Calvary Rocks and Chimney Rock is a great option. It follows the same route as the 10-mile Riprap circuit, but turns around right after two excellent viewpoints. After our long hiking trip to North Caroline and Tennessee, I came home with a really sore knee. Every step I took, it felt like someone was sticking an ice pick into the soft tissue under my kneecap. Even after a week’s rest, it didn’t feel better, so I reluctantly made an appointment with an orthopedist. He couldn’t find anything obviously wrong, so he diagnosed it as a bit of IT-band syndrome, a bit of inflamed cartilage and maybe the beginnings of arthritis. I was given orders to cross-train… which is essentially code-speak for ‘do something other than hiking‘. Bah! So, I spent most of June and July in the gym, doing cardio equipment and weights. 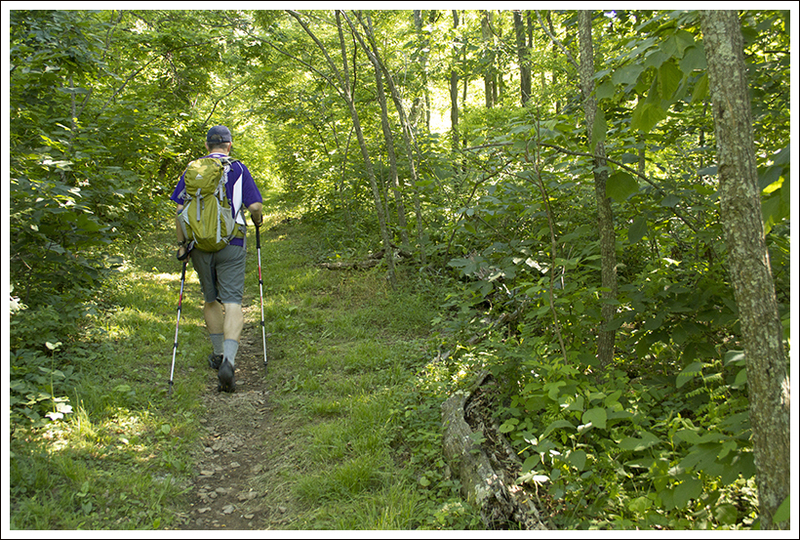 I only managed to hit the trail a few times – all short and easy hikes. This walk to Calvary Rocks and Chimney Rock was one of those hikes. It was a beautiful, sunny, crisp day for midsummer. We set out in the morning and had the trail almost completely to ourselves. The hike started off in the same parking lot as the longer Riprap loop hike. 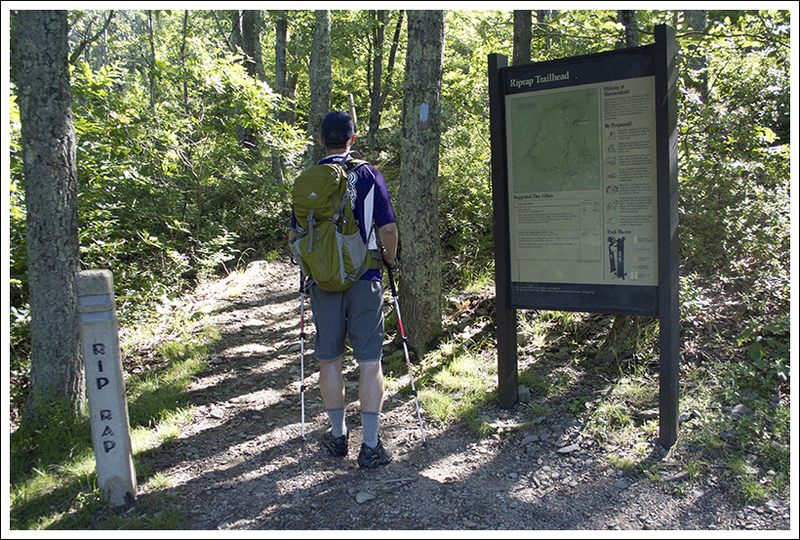 The hike follows the Appalachian Trail uphill for almost a half mile before intersecting with the Riprap trail. At the junction, turn left onto the Riprap trail. The first viewpoint, Calvary Rocks comes shortly after passing a small talus slope. There are two small outcroppings of rocks at this viewpoint. It’s pretty, but in my opinion, the second view from Chimney Rock is the nicer of the two. Taking in the view. 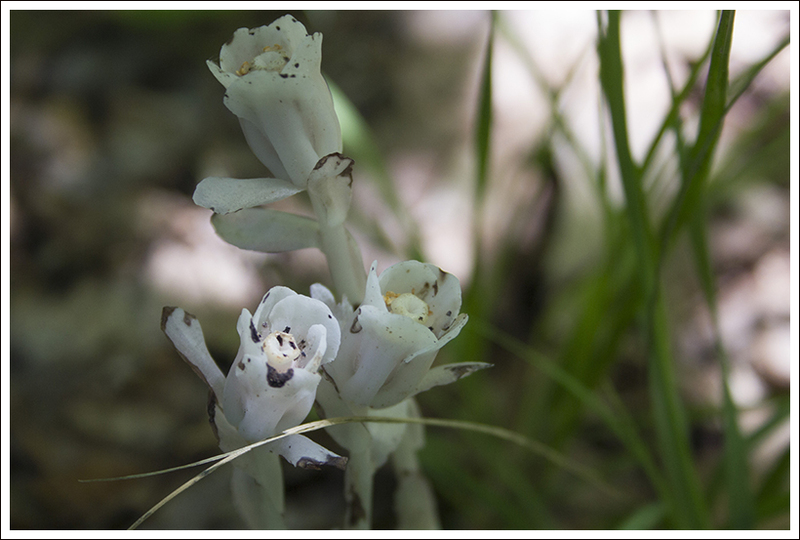 Below: Flowers blooming along the trail; A bug finds shelter; Ripening blueberries; Indian pipes. The second view comes just a few tenths of a mile past Calvary Rocks. The view is great and this outcropping is a bit more expansive. There are lots of places to scramble around. 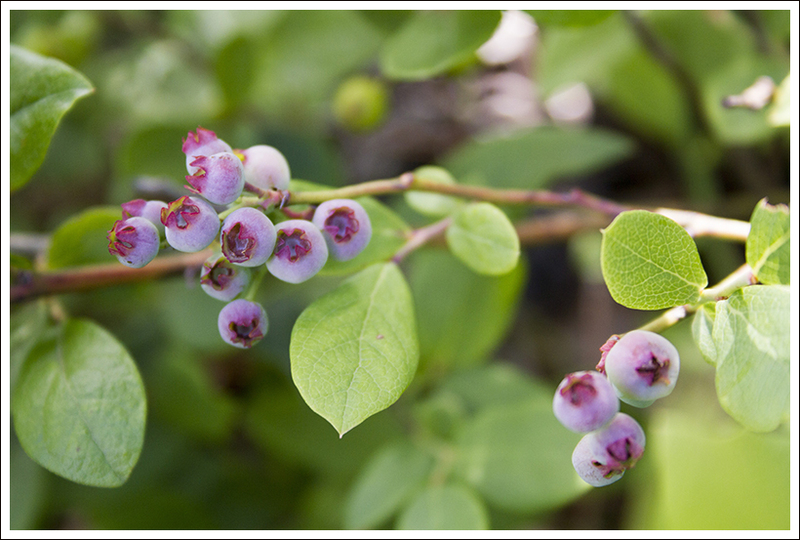 There were also a ton of blueberries growing around Chimney Rock. Most of them weren’t ripe, but I found a few that were dark purplish-blue and sweet-tart! We lingered on the rocks for a while before heading back the way we came. It was great to be out on the trail after so many days of doing indoor workouts, and (thankfully) my knee held up pretty well! This truly hasn’t been a typical summer in Virginia. I remember brutal, hot, muggy summers in which we never could feel we could escape the heat. Luckily, this summer has been much cooler. 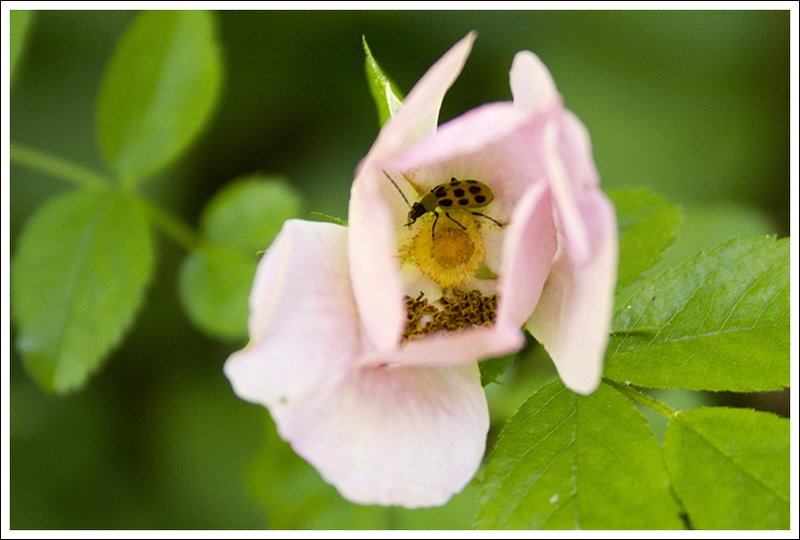 The bugs have also not been as bad this year, which has made hiking much more pleasant. This was a test for Christine’s knee to see if she could take another hike after just a little rest. The amount of hiking we did in the Smokies demanded for some time off, but I was glad her knee was cooperative on this hike. 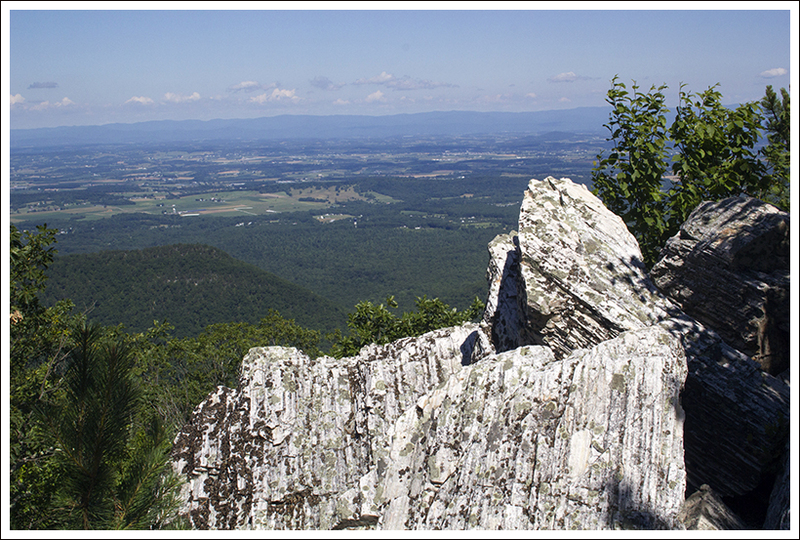 Calvary Rocks are geologically different looking than most of Shenandoah’s rocks. Below: Views! We started from the parking lot and began our hike uphill on the white-blazed Appalachian Trail. In about .4 miles, you reach the junction with the Riprap Trail. Take a left here and the trail goes down steeply before ascending. 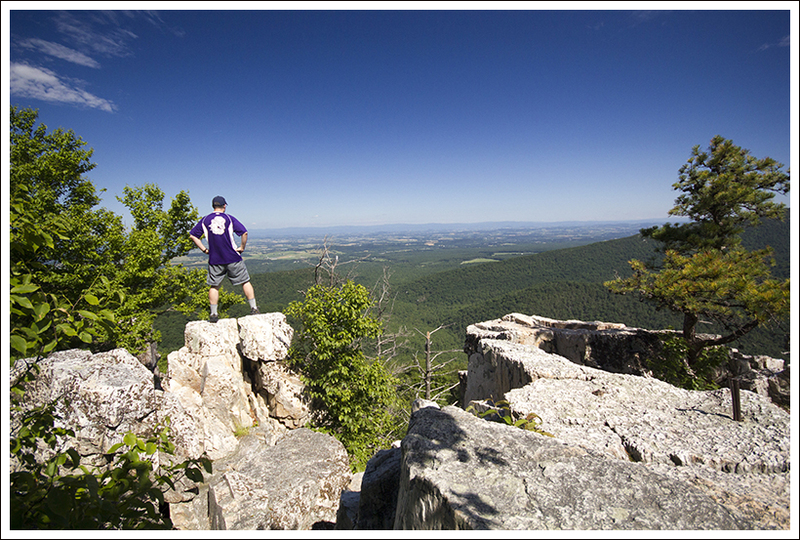 Around 1.1 miles, you will reach your first viewpoint of Calvary Rocks. There are some very nice views here, but not a lot of room to spread out if there are others on the trail. Continue from here along the trail and around 1.5 miles, you will reach Chimney Rock. 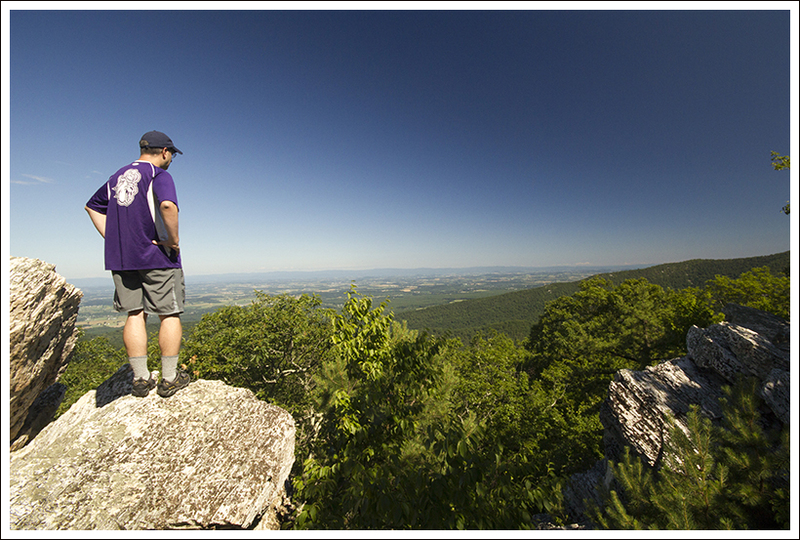 Chimney Rock has great views and a little more room to enjoy the views with others or stop to eat a snack. Along the trail, Christine was complimenting me on my ability to be able to find indian pipes. She is definitely the wildflower expert between the two of us, but for some reason I tend to spot indian pipes before she does. We found a few nice specimens along the trail. 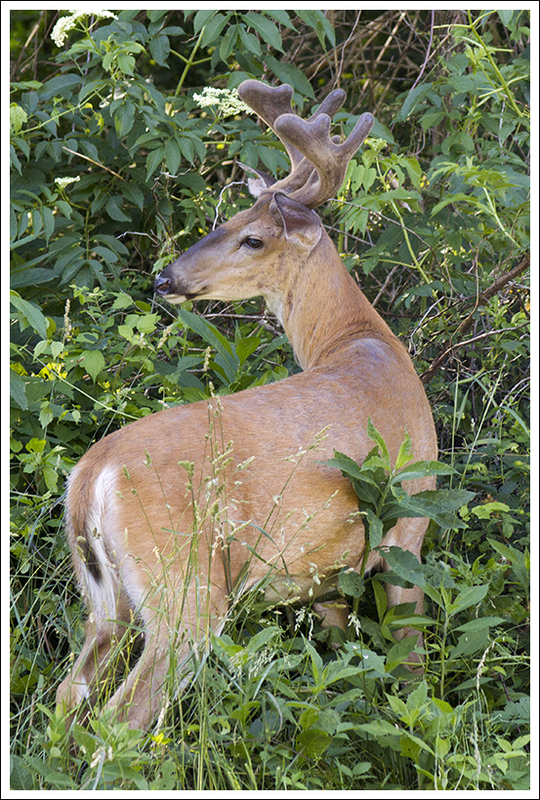 Handsome buck near the trailhead. We lingered for a short while to enjoy the views on such a nice summer day. We made our way back the same way on the return trip. 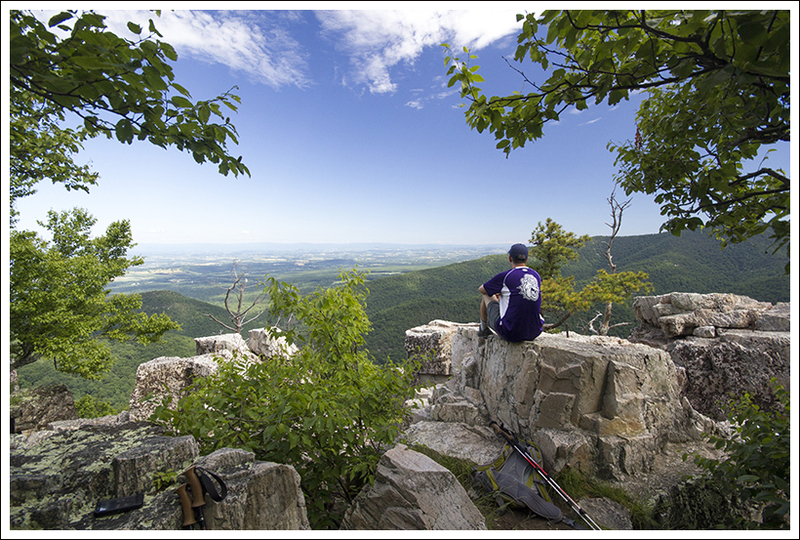 If you would like some nice views with little effort, this is hike in the south district of Shenandoah National Park that shouldn’t be missed. Difficulty – 2. This hike is short and easy without much climbing or descending. Trail Conditions – 4. The trails was in great shape. Waterfalls/streams – 0. None. If you want to see streams, you’ll have to do the full Riprap loop. Wildlife – 2. We saw a nice looking buck near the trailhead. Bears are known to frequent this area. 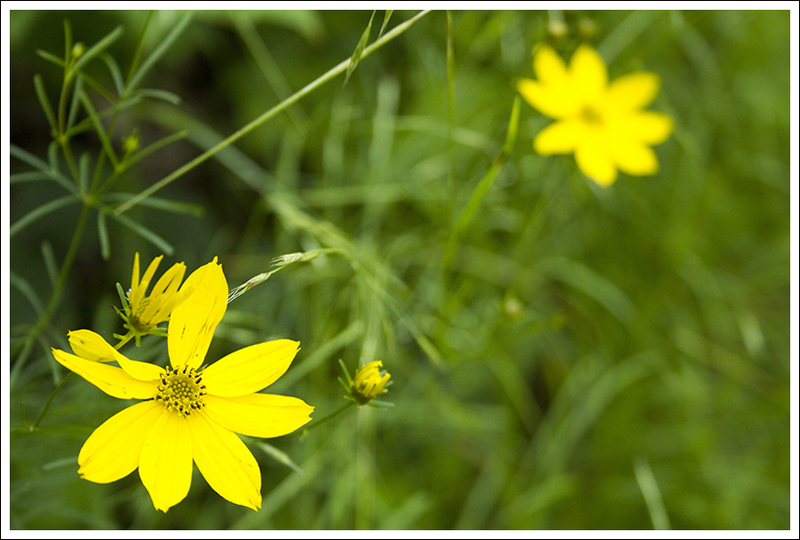 Ease to Navigate – 3. The trail is well-marked and there is just one trail junction. Solitude – 3. We didn’t see many people at all on this hike! 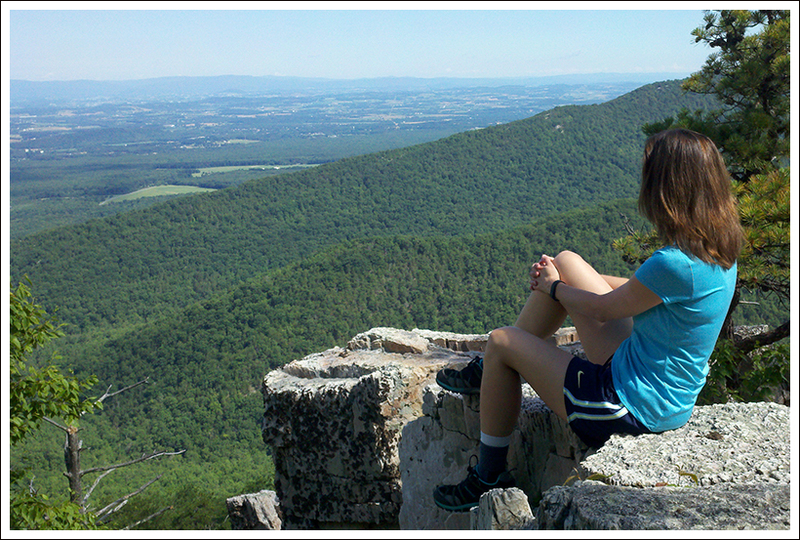 From Skyline Drive, park on the western side at mile marker 90. There is a parking lot specifically for Riprap hikers. With this knee thing, I remember the exact moment on the Grandfather Mountain trail when my knee started to hurt. It was right after I twisted it coming down the very rocky, tricky descent. And truth be told, I don’t think I really agree with the IT band/inflamed cartilage/arthritis diagnosis. I think I had some kind of soft tissue injury that didn’t show in x-rays or a physical examination. That said… I have talked about Lyme with my regular doctor, but this knee thing (I’m pretty sure) was just a knee thing! Thanks for mentioning Lyme, too. There have been more and more cases in our area, and it’s something everyone needs to think about. Our dog has had Lyme and we have a few hiking friends who have been diagnosed.